Travelling in Mumbai has its risk. No, I am not talking about the divide on religion. I am also not talking about which team do you support in IPL. Neither am I going to talk about potholed roads which are in a competition with the craters on the moon. Today I am going to vent my emotions on a particular thing that my nose can freak me out within seconds. Ok, make that minutes in case your sensory organs fail to react and send signals to your brain instantly, which may only happen if you are in a midst of experiencing a mutual pleasure. You know what I mean, heh (Wink)? So as I said, travelling in Mumbai has its risk. Risk of being forced into a box emitting various kinds of stench that can be nauseating at times and can also be a cause of excessive inhaling of foul smell leading to severe headache clogging the functioning of the brain. Even companies marketing various room fragrances will fail miserably in this case. The box which I am referring is a moving box which allows you to reach to your destination, but leaving you in a dazed state till you get out of it. Yes, you have guessed it right. I am referring to the local trains which usually and especially in summers are an olfactory of foul body odors. Just recently, unwillingly and with a will of steel, I boarded a local at a peak evening hour to reach my home station. A slight push from behind and I was inside the chamber of dark nauseating pungent smelling humans. The train purred and halted at the next station. Again, a slight push from someone who had just boarded the overly stacked chamber of humans, led my nose straight into the raised armpit of a fellow passenger. For a minute, I thought of my lovely family, closed my eyes, expecting myself to reach the doors of heaven. I regained my senses, pushed my neck behind taking my nose along and winked plenty of times to come out from the hands of the death. I somehow managed my journey without bumping my nose anywhere. Simply ask a Mumbaikar who has been travelling in the second class of smelly, sticky and sweaty chamber during the peak evening hours, I am pretty sure that the story of mine will match with his. 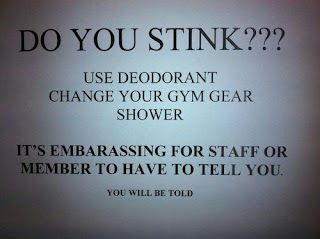 Then, there is another gas chamber. People over there release much more than they should and they usually release such foul smells with a silent blast of a hydrogen bomb within themselves. Or, in case he is unable to control the sound, he produces a grunt at the exact time, while exercising and concentrates building muscles as if nothing has happened. Is there a special place reserved for such persons in hell? I seriously hope so. So, you have got it right. I am talking about the gym, which you prefer to visit regularly but go once in a blue moon. Of late, I always prefer to keep distances from the ones who have just exercised and choose not to have a shower at the gym but at home. 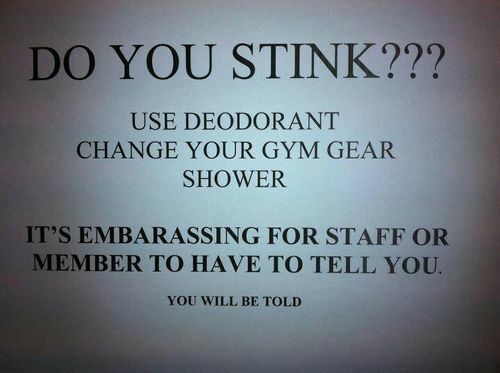 One day I encountered a series of such special species, who not only refuses to have a shower at the gym, but also prefer not to spray their armpits with deodorants. Hence, the next day I decided to wear a white coat with a sign hanging around from my neck saying, ‘Dr. Armpit’ with cans of deodorants placed strategically. However, I dropped the idea after thinking the reactions to my simple life saving action. So, the next day I decided to go to one of those specie and told them in exact words, maintaining an eye contact, “I am having it enough. It is time I gift you my special ‘Mantastic’ deodorant.” I pulled the can out of my bag and placed it in front of him. From next day onwards, I was awarded with exercising souls dressed aplenty with deodorants. I felt claustrophobic and a sheer facepalm moment for me. Anyways, the moot point is, our nose knows, can #SniffSniff and understands the danger coming towards us. The only things you need to do is keep calm and pray you get out of it soon.